Read what people are saying about their experiences with the Riding in the Zone Personal Training Program. I found the method of teaching, communicating via intercom during a ride, is an absolute game changer for me. Instead of “do you remember when you were cresting that hill? do you remember the sharp left turn 5 minutes ago?” it is a real-time comment. Every comment was directly relevant, and the impact immediate. Instead of guessing where the tipping in point was, or the apex, or the point to go to 2-clicks of gas, it was right there in my ear. Gone was the frustration of “I keep getting this wrong, and don’t know why” to a wow! feeling of that’s how I do it… now I’m going to do it on this next corner. “Rinse, and repeat”. On road training with a coach giving instructions in your helmet is priceless..! A testimonial from Vic B. “Be the boss of your bike”. I heard these words in my helmet over and over again during my extraordinary 2 day Personal Training Course with Ken Condon. My 2 day course with Ken was a very real revelation as to how much I still had to learn regarding riding well and in full control. 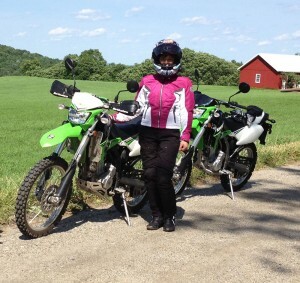 At 69 years old, I have been enjoying riding for 13 years and I plan to be riding my FJR for at least another 13 years !!! After having read both of Ken’s books & then attending a Non-Sportbike Track Day last year, I decided that now was time to ensure I had the proper foundation & skills for my long term riding plans .. so I signed up for Ken’s 2 Day Personal Training Course. Without a doubt Ken’s course truly exceeded my expectations !!! His awesome training skills coupled with his keen eye for rapidly identifying the bad riding habits I had fallen into helped me to focus on exactly where I needed to improve my skills. The course rides, through some challenging roads (for me) in the picturesque Massachusetts & Vermont countryside, then provided numerous opportunities to practise improving those skills – with constant coaching and very candid feedback from Ken. But it was following Ken, cornering through some twisties, that opened my eyes to the tremendously rewarding & outrageously fun experience that choosing the correct lines and riding as “the boss of your bike” can be for me. I now have lots of practise planned to ensure that I retain the extremely valuable & fun new skills that I learned in Ken’s Personal Training course. I’m already using the videos of the rides with Ken as refreshers. In fact, I’ve also signed up for the next Non-Sportbike Track Day, on August 22, to continue practising those new skills – while once again learning from Ken’s presentations! All I can say is – Even if you have years and years of riding experience, you will improve your riding skills & increase your riding fun by taking Ken’s 2 Day Personal Training Course … You will not be disappointed !!! A testimonial from Craig Ripley. A testimonial from Peter F.
Just wanted to send you a quick note of thanks for the excellent advanced rider training program you presented this past weekend. Your thoughtful and focused approach to enhancing rider safety was fabulous. I greatly appreciated your time spent coaching me via radio on several occasions as we traversed some technically complicated roads which I had never been on before. My ride home gave me numerous opportunities to practice what you taught, and as a result, I felt far more comfortable and in control of my motorcycle. Thank you! A testimonial from Caryn D.
I’m writing as requested to provide feedback on the safety course I did with the help of the Paul B. memorial scholarship fund. As a reminder, it was the Riding in the Zone 2-day advanced rider training course in western Massachusetts taught by Ken Condon (http://www.ridinginthezone.com/tour-program/). As it happens, I’m struggling to figure out how to word my feedback without it turning into the kind of “glowing praise that might be mistaken for a commercial endorsement” that you cautioned against! I really can’t say enough good things about the training. Ken sent each student a survey beforehand to assess our riding skills and find out what we wanted to get out of the training. When we met for breakfast the first day, he acknowledged each of our goals and explained when and how we would address them. I appreciated this attention to detail, as I learn best when I know in advance what the goal of the exercise is. Going into the course, my goals were to connect with like-minded riders, improve my slow-speed maneuvering, and get used to my new bike in a safe environment. In retrospect, I expected far too little. Sure, I made new friends and improved my bike handling skills, but I also completely changed my approach to riding, both how I interact with my motorcycle and how I read the road. This training was completely different than the MSF basic rider course I took a couple years ago. Ken coached us (via Bluetooth communicators) in real-time as we rode down the road at speed. He also gave us a stream-of-consciousness monologue of what he is thinking as he rides, which was helpful because it made me realize how much I don’t usually notice but should be paying attention to, like road surface conditions, cars in driveways, street signs, and other clues to help guide a rider such as the direction the power-lines point as they disappear over a rise. As an Olympic athlete, I’ve had thousands of hours of coaching from some of the most respected coaches in the world, and I have to say Ken is among the best coaches I’ve ever worked with. He is able to explain concepts in ways that are both easy to understand and memorable–so much so that as I rode the 300 miles home the next day, I could still hear his voice in my ear reminding me of everything I learned. But what I appreciated most was Ken’s positivity and sensitivity. He has a way of pointing out what a pupil is doing wrong and correcting it without the person ever feeling frustrated or discouraged, and he is able to intuit when his pupils have reached information saturation and either need time to process and practice, or need to just go have some fun riding the road. I honestly can’t think of anything I would change about the course; I think it’s worth every penny of the $975. The only thing that might be an issue is how much time you end up spending in the small group of three riders plus a coach: two full days including breakfast, lunch, and dinner. It worked great for me, as I really liked the other two women who took the course (as well as Ken’s wife, who rode with us the second day) and enjoyed spending time with them, but if for some reason a student ended up in a group with someone he or she didn’t get along with, it might ruin the experience. A testimonial from Henry Y.
I am back in Philly after a delightful ride back. I wanted to thank you again for a wonderful day of riding. I learned a great deal, had a lot of fun and experienced magnificent scenery, backroads and people. Most importantly, you truly do incorporate mindfulness into riding. You don’t just help to ride better, but empower to find that place where we, the road and the machine become one! I look forward to becoming your repeat customer. The lessons I’ve learned are invaluable and are worth every penny that I spent. Having now trained with Ken on two different occasions, I cannot think of a better, more thoughtful and caring motorcycle coach. He teaches and practices mindful motorcycling, gently and deliberately cultivating the awareness of being one with the motorcycle and the road. With that awareness one can truly ride in the zone! A testimonial from Tracey Z.
I had an excellent coaching ride with Ken recently. We rode through NW MA and SE VT, on some fine twisty country roads. Just what I like. I started riding motorcycles about 40 years ago, and now at 68, I am still going strong. Every year I try to find a new learning experience to extend my skills and stay sharp. Ken uses a bluetooth communicator to coach you as he rides behind – observing what you’re doing – and not doing. He really helped me improve my slow speed tight maneuvering. He took videos as we rode and when I watched them at lunch, his feedback that my medium and high-speed turns could be smoother made a lot of sense. During the afternoon, I could really feel the improvement. I would recommend Ken to anyone looking for a good way to advance their skills. A testimonial from Greg T.
“A day of training with Ken has elevated my riding to a level I wasn’t aware of and further bolstered my confidence and enjoyment on the bike, too.” – Greg T.
This was a great experience from pre-ride to post-ride. I very seldom get to meet and/or work with accomplished professionals who operate outside a conference room (let alone at slow, medium and high speeds under continuously varying conditions.) Some forms of mastery are more impacting than others, and it really was a privilege to meet you this way and for you to make yourself available for an entire day (even for a fee, which I contend is modest compared to how you prepare, execute and follow-up.) I will do my best to make this the first of many training experiences! Personal Training Tour with J.P. and J.C.
A testimonial from Jim C.
Personal Training Tour with K.L. and T.L. We’re off to Oregon for a three week gallivant this summer on our bikes. Seeing all the hairpin turns on the maps I feel much more prepared to meet them with safety and confidence thanks to your Dad. Thank you, Ken. A big shout out to Ken Condon for his amazing teaching. We took his day long personal training to prepare for our 3 week trip to Oregon. We rode 2200 miles over some of the twistiest, snarly roads through the mountains and had a blast. I took those hairpins in both directions, rode the seemingly endless curves maintaining sight lines and feeling so much more in control. Here’s one of our favorites – McKenzie Highway (OR 242). Thank you, Ken, for giving me the skills that made this ride so much fun. A testimonial from Steve B. 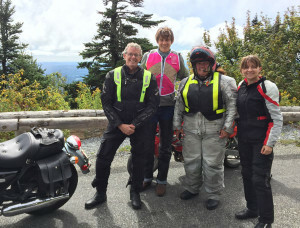 A few weeks ago, I had the opportunity to take a “Personal Training Tour” with Ken Condon, author of “Riding in the Zone.” I had recently taken the MSF’s ER course, and was a bit disappointed in the curriculum- it seemed to be nothing more than the Basic Course, minus the classroom work. In addition, the restrictions put on me during the class (no covering brakes, no feathering the rear brake during slow-speed manuevers) seemed like a step backwards to me after a few years of riding in the real world. At a subsequent meeting of the Yankee Beemers, I met a rider who turned me on to Ken’s program. He also mentioned the Paul B. Memorial Scholarship, and suggested that I apply. I went online and filled out an application, and within a few days I had a check for $250. I sent Ken an email, and we scheduled a date. He suggested I get his book, and familiarize myself with its concepts and practice exercises. A self-assessment survey was also completed in preparation for the day. We started out with some parking lot practice- slow, tight turns and full-lock turns from a stop. The latter was probably the maneuver where I felt weakest, but a couple of hints from Ken on the proper technique and I was on the right track. I still feel a bit awkward with this move, but under Ken’s guidance I was able to nail it a couple of times, so I know what doing it right feels like, and this is what I now aim for in my daily practice. Keep that right hand off the brake! After about 30 minutes of that, my clutch hand needed a break, so we stripped off the rain gear under clearing skies and headed up Vermont way. We took back roads through some beautiful fall foliage, the leaves scattering behind Ken’s bike as he led the way. He kept up a constant stream of narration, giving a useful insight into his thought process as he reads the road, anticipates hazards, and lines up for turns. After a while I got to lead, (at which point Ken turned on his camera) and after one particular series of curves, we got down to business- he taught me how to trail brake and use the “delayed apex- quick turn” methods of cornering. He cleared up a misconception I’d had on delayed apexes, and my cornering improved immediately. At our lunch break in Wilmington, VT, Ken pulled out his laptop and uploaded the camera footage so we could go over a few things that he had mentioned on the road. Because his camera is mounted over the front wheel, it was easy to see when I took a less-than-optimal line in front of him. We also spent some time talking about our respective paths to the motorcycle world, the benefits of track days, and how we both need to meditate more. After lunch we headed out again for some more cornering work, this time including some ascending and descending hairpins. We were able to do several runs on each corner (necessitating numerous slow-speed U-turns), and I improved every time thanks to his coaching. We made another stop at the east end of the historic Hoosac Tunnel for a much-needed afternoon break. The short walk brought home how much effort it takes to ride safely: it’s not necessarily difficult, but it does demand constant attention and evaluation- especially when putting newly-refined learning into practice. Refreshed, we got back on our bikes and continued the trip back down to Ashfield. On the way, Ken showed me some of his “secret roads” that featured beautiful scenery and great riding. We ended the day back at the parking lot, where we now worked on quick stops and emergency swerving maneuvers. Under Ken’s coaching, I was able to gradually reduce my stopping distance to the point where I started to feel my eyes bugging out of my head. “That means you’re doing it right now,” was the reply. After the afternoon parking lot session, we went over what I had learned, and discussed how I can continue to integrate the new knowledge into my riding skill set. I had already picked out some local roads in my area where I can practice the new cornering techniques, and I resolved to add at least a few minutes at the beginning and ending of each day with some parking lot practice. Finally, Ken uploaded the video footage from the day, and I came home with a record of my performance that shows a distinctive improvement over the course of the day. And on those corners where I didn’t do so well, I have Ken’s line to see how it should be done. This master class has had a profound effect on my riding since that day. I always try, as Ken put it, “to look for opportunities to interact with your motorcycle,” and not be a passive driver. It’s even changed the way I drive my car- hazards are hazards, after all, and being able to recognize clues about the lay of the road and intentions of other drivers is a valuable skill. Perhaps the most telling evidence of my change in attitude, however, came in the office a few days later. A co-worker had recently changed the wallpaper on his computer desktop to a scene of a New England country road in all its autumn glory. But the first thing I noticed was the convergence of the yellow line and fog line as the road disappeared around to the right- A Decreasing Radius Turn! Let’s be honest- this type of training is sorely lacking in the U.S. We have the MSF classes of course, but the curriculum is constrained by the need to teach a relatively large class a standardized protocol designed to efficiently get people riding as quickly as possible. Under such conditions, there’s not a lot of room for detailed, customized instruction on the finer points of riding well, and the result is that many riders leave that class thinking they are fully qualified to get out on the road and ride safely. Further, many may not realize that several of the techniques taught in that class are there to ensure the safety of those on the range, and may not be the best way of riding in the real world. In an ideal world, individual motorcycle instruction in the U.S. would be mandatory before getting one’s full license. This intensive training is not inexpensive, but it’s worth much more than what it costs: a well-trained, confident rider is a safer rider. Thanks to the BMWMOA’s Paul B. Memorial Scholarship, many more riders can now have the opportunity to make this investment in their motorcycling future. Personal track Day Training. Ken follow Y.K. Personal instruction day with Ken Condon was amazing! He immediately identified areas I needed to work on, which was opening the throttle a bit slower at the beginning and then progressively cranking it up. It helped me stay smoother, more consistent and inevitably faster. I was able to really pick up some speed and confidence by the end of the day even though that was not the goal. Having a helmet communication system on the track was great too! It was not distracting at all. Really, I wish my helmet would always keep talking with Ken’s calm voice with timely and great advice. Will definitely do it again! Learn about Track Day Training HERE. Basic Off-road and dual-sport training is available. First time riding a dirt bike and it couldn’t be any better! First Caroline and I had to do some parking lot drills. I don’t think we had any choice but it was super helpful! I even got to touch my knee down! don’t ask how. Ken is the best riding teacher in the history. Then we went on some beautiful gravel roads. This was by far one of the best days ever. Can’t wait to ride again! Thank you Ken. Interested in one of Ken’s books?